My relative claims that, should he win some millions of dollars, his life would not change one whit. We looked closely at his life and determined he was telling the truth. He has everything that one could possibly want, including the ability to stun his guests by doing push-ups on the living room floor at the age of 77. If he wishes to eat vegetables with his dinner he steps into the garden and pulls up garlic, onions, beans. He wakes regularly at 3 AM and goes for a walk before returning for a hearty, greasy breakfast, the like of which Spouse and I can only eat but once a year. Spending time in the company of a person who wants to change nothing, who asserts with honesty that he has all he needs- that is a deeply satisfying environment to step into. 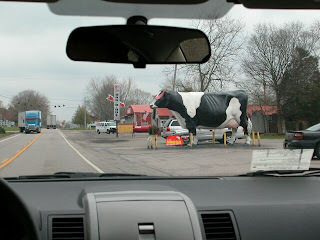 Spouse and I might only change one or two things: we would like to buy a cow, a friendly and large bovine such as that which we saw while driving by the Kentucky border, and perhaps a chicken or two, and a green field to keep them all in. I tried to do a few pushups recently. It took a few days to recover. I like the greasy breakfast part of his program. The livestock acquisition is another matter. Happy weekend. I go to the gym when I can but I'm not at all in push-up kind of shape. I walk a lot, that's all I've got.